With Airfoil, you can now send any audio right through your AirPort Express, Apple TV, as well as other PCs and Macs. Send audio from RealPlayer, Winamp, and other media players to the AirPort Express. Send audio from Rhapsody, Yahoo Music, and other music stores to the AirPort Express. Send audio from Pandora and other web-based audio to the AirPort Express. Transmit any audio!You can send audio to multiple outputs around your house. With Airfoil Speakers Touch, you can send any audio from your PC to your iPhone, iPod Touch, or iPad on the local network! You're no longer stuck with just iTunes on your remote speakers. 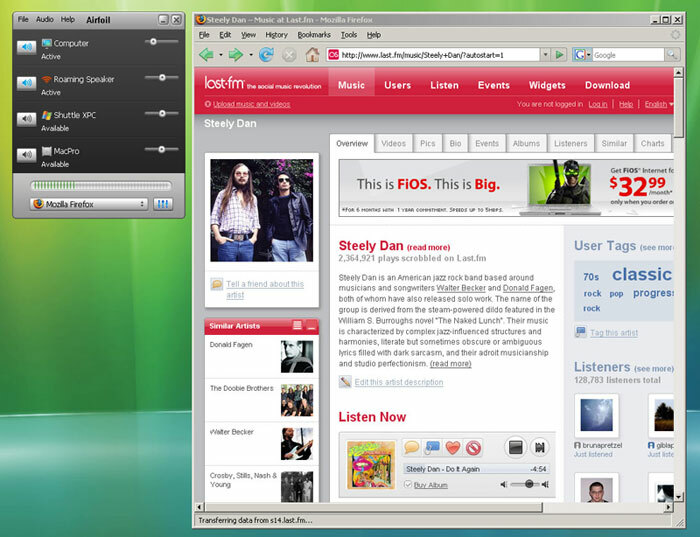 With Airfoil Speakers, you can turn any computer into a remote audio output. You can send audio to multiple outputs around your house, all in sync. In addition to the AirPort Express, Airfoil can send audio to the AppleTV! Qweas is providing links to Airfoil For Windows 4.6.2 as a courtesy, and makes no representations regarding Airfoil For Windows or any other applications or any information related thereto. Any questions, complaints or claims regarding this application Airfoil For Windows 4.6.2 must be directed to the appropriate software vendor. You may click the publisher link of Airfoil For Windows on the top of this page to get more details about the vendor.